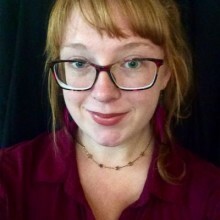 As Auraria Library’s Subscription & Purchasing Manager, Molly provides leadership in advocating with vendors and other external stakeholders on behalf of students, staff, and faculty of Auraria Campus. While obtaining her MLIS, she conducted an independent study on the topic of the intersection of licensing & interlibrary loan, and remains passionate about the impact of licensing on library resources and services. She is a member of professional organizations such as NASIG and ALCTS, and currently serves on the planning committee for the 7th Annual Kraemer Copyright Conference.